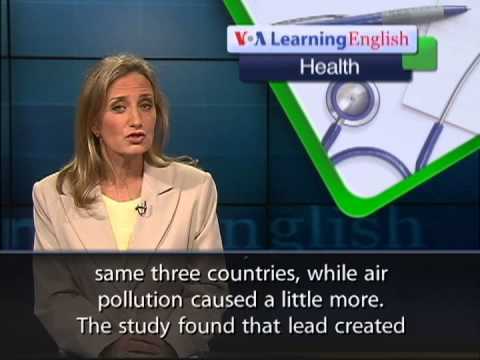 Subscribe to the VOA Learning English Channel: youtube.com/voalearningenglish From VOA Learning English, this is the Health Report. Millions of people in developing countries live near toxic waste sites. A new study looked at the dangers of living near these chemical waste dumps. An environmental group in New York studied water and soil samples from 373 waste sites in Pakistan, India and Indonesia. The researchers found that more than 8.6 million people were living near the sites in 2010. Richard Fuller was an author of the study. He says lead, chromium, mercury, phosphates, pesticides and other kinds of chemicals were found. Mr. Fuller heads the Blacksmith Institute, which paid for the study. The institute works to solve pollution problems in low- and moderate-income countries. The study says people living near the dumps lost more than 828,000 years of healthy life from toxic waste exposure. The researchers based this finding on estimates of illness, disability and early death. They say malaria caused less illness and early death in the same three countries, while air pollution caused a little more. The study found that lead created the highest pollution levels. If this metal is absorbed into the blood, it can harm the brain development of unborn babies and lower the intelligence of children. Two-thirds of those exposed to lead near waste dumps in Pakistan, India and Indonesia were children and women of child-bearing age. The Blacksmith Institute is studying toxic waste sites in 70 other developing countries. It hopes to help organize clean-up efforts. Richard Fuller says the countries he is working with want to cooperate, it's just going to take a lot of work. For VOA Learning English, I'm Laurel Bowman. Смотрите видео The Dangers of Living Near Toxic Waste Dumps и вы быстро изучите английский язык.